That's an amazing lot of stuff in a shoebox! I haven't participated before, but have all ready begun collecting for next year. I wonder if we are better off sending more gift boxes with fewer items. For a third-world child, wouldn't this be an overwhelming number of gifts? Again, I've never done this before, so I want to do the best I can next year. Thanks! Hi Mary Ann! And welcome to the world of shoeboxes! That's a good question, I remember a story where a child opened the box, chose and item, and handed the rest back because she thought she got to pick one item from it. Some people do prefer to pack less items in more boxes. 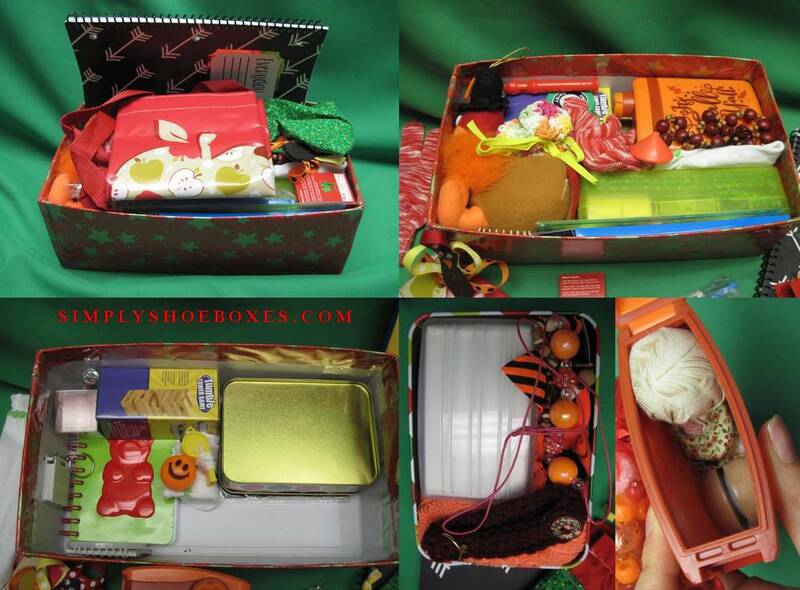 Even different members of our family put differing amounts of items in a shoebox. 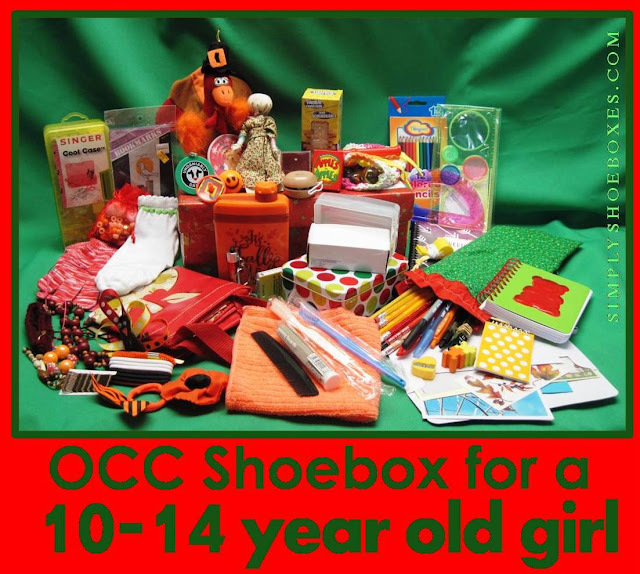 For me, I've shared below my reasoning of this box, but remember, there's no right or wrong as long as you follow OCC official guidelines (start with regular sized box, pick Wow item, fill with school, hygiene, and toys). First, I want things from different categories, since I don't know their needs. In many countries kids can't go to school without school supplies, so I try to get a lot of those. Enough hygiene supplies to aid their health and confidence. A sewing kit so she can mend or make herself clothes, etc. A water bottle in case she has a safe water source, but not always available (say her school has a filter, but her home has a dirty water hole). A bag to be sure she can carry it all. A flashlight so she can safely go outside at night. A whistle for safety-girls may have to walk alone distances, and I can see how one could help keep them safe from others. Jewelry/hair bows to make her feel special. Plus some fun items to be sure it is exciting, plus a mix of fun items she can do by herself and with others. Since there are so many needs, and I'm not sure what they are, I try to meet as many as possible. Second, I don't know what she'll like so I try to put a verity-for instance, this box has 3 games so she can choose among them-maybe she doesn't speak English well enough to play Apples to Apples, or maybe she's in a hospital bed and can't play marbles. Third, I like to make use of every inch of the box I'm sending, I got in the habit sending care packages-hate to waste space shipping air-haha! Forth, the children often have friends, cousins, or even siblings that didn't get a box that they may wish to share with. I once read something about one thing that bothered people in poverty was not being able to give. So, with a few small extras, they'll have something to give other children, or even parents and other adults. I remember hearing a story where a child gave one of the people handing out the boxes something from theirs to take back to the person's child. So, that's my thinking. But, like I said, it's not really a right/wrong thing, just a personal preference. What did you put in the sewing kit, the cross stitch kit and the beading kit? The cross stitch kit, was just a starter kit that came pre-packaged. I think it had cloth, floss, needle and instructions.